The flavor and texture of these are addictive…. and I defintely do not feel as though I am missing out on anything. These gluten free, egg free cookies surely fill the spot for my sweet tooth. Combine butter, honey, flours, baking soda and salt. Scoop batter onto sheet trays. Bake for 9-11 minutes until golden brown. I have already made these several times – a double batch the last time because they go so quick! Delicious! Love your website! these are my go-to cookie and they’re fabulous. so easy, so quick….my friends can’t tell the difference between these and sugar-laden cookies. great recipe! I made these the other day and they ended up running together and becoming one big thin cookie. Do you know what I might have done wrong? That one big thin cookie was absolutly delicious!!! So I definitely want to try them again…if I can figure out what I did wrong. Oh no! Well there are a few factors…. first make sure your oven is preheated. Then when measuring your flours, be sure to firmly pack them. It is also helpful to chill the dough before baking, as that will help with the spreading issue. Or if you don’t have time to chill the batter, add 2 additional tablespoons of almond flour to the batter. I also bake mine on silpats, which I think makes a difference. Thanks for the feedback! Good luck! Chilling the dough worked great. Thanks for the tip! I love how simple your recipes are and how great they all taste. I have missed that fresh out of the oven toll house choc chip cookie and these really do come darn close to the original. Your recipes are the first that my kids and I both like – my goal is to eliminate all Gluten baking and I think I will be able to do it now. Thanks Lissa! I’m glad you and your children are able to enjoy my recipes. It makes it alot easier to be able to cook one way for everyone and please everyone’s palette! All your recipes look fantastic! So far I have tried your blueberry muffins which were thoroughly enjoyed by all! Just wondering, could another sweetener other than honey be used in this recipe (and other recipes)? The honey taste comes out too strong for me, but I’m worried that if I use stevia the batter will lack bulk… any suggestions? Have you tried to bake with Agave or Maple Syrup? They are the most similar in texture and sweetness that I think would adapt well to my recipes. Maybe try half honey/half agave? Just a thought. Let me know what you try and how it works out for you! Can you add vanilla extract to this recipe? You are very welcome :) Glad they were well received! Holy cow Michelle! These are delicious! I made them with Earth’s Balance and Agave nectar. So good! I had to share this story with you! I was making your chocolate chip cookies this weekend and I kept getting pulled in different directions. One of the things I love about this recipe is how EASY it is and still delicious. Anyway, the cookies seemed a bit more “crumbly” than I remembered them being but I thought I maybe added a bit more coconut flour. I use a small scoop and just packed it in and they baked ok – they kept their round shape. Anyway, my kids and I were eating some and couldn’t put our finger on what was different. They tasted like shortbread cookies with chocolate chips in them. I then realized I had forgotten the honey! The kids STILL loved them. We are calling them the shortbread chocolate chip cookies! They are really good! Well these are the best tasting cookies I have ever had, period. Their texture is a bit off, and they didn’t harden in the same way I would expect a regular cookie to. Maybe I needed to chill them in the fridge for longer/cook them a minute more. But as for their taste? Phenomenal. Is there a substitute I can use for butter? Several of your recipes call for a half cup of butter,as in your chocolate chip cookies. My son cannot tolerate dairy or wheat, so it is tricky to find recipes. I would appreciate any input on how to substitute for the butter. They also sell vegan butter! I can’t have dairy myself, along with gluten and that is what I use. I found your site listed in the appendix of William Davis’ _Wheat Belly Cook Book_ and am really liking your recipes so far–thanks! Dr. Davis says honey raises your blood sugar quite a bit a recommends things like liquid stevia and granulated xylitol instead. Any idea why he would have such opposite information? My sister-in-law says the same thing about honey. Do you think I could make this recipe with xylitol or does it need the thickness from honey? I’m glad you are here :) I chose honey as my sweetener of choice because of the SCD, which has helped me manage my Crohn’s disease. Since I have not worked with xylitol, I can not confirm if it would work properly in this recipe. All you can do is experiment. I would love to know how it turns out for you. Best of luck! Any thoughts on a substitution for almond flour for this recipe? My doc suggested staying away from peanuts and almonds due to a low sensitivity. I’m also working towards going GF and was excited to see this recipe. I’m definitely not familiar with the science of baking with different flours yet but would appreciate your thoughts on a replacement possibility to try, if any. and sub coconut oil for butter….. very yummy !!! Nailed these cookies this time. My first attempt was alright but I didn’t use an almond flour as fine as the one that you use. It was labeled almond meal/flour. The second try was with the brand that you use and they turned out just great. I used parchment paper and it was very easy to remove my cookies. Thanks so much for the great recipes. At first I was doubting the flavor of these ones since they use more healthier ingredients. But boy are they amazing…delicious. They are perfect! And….they are better then the ones that have sugar and all that stuff. Thanks so much for this beatuiful website. I <3 reading it. Oh! I have also made your cinnamon raisin cookies and the double chocolate pecan, incredible! At first, I was doubting the taste on these since they have such few ingredients. But boy, these are better then the ones full of sugar and bad stuff. Thanks so much for this INCREDIBLE recipe. And your website, is the best. I made these into cookie bars by doubling the recipe and baking for about 20 minutes until browned. I also added walnuts and coconut flakes to the batter. They are so good. I am trying not to eat the whole tray ! Thank you for the delicious recipes! Hi – I’m wondering what kind of chocolate chips you use? Are they sugar-free? I’m on SCD but wanting to see if I can tolerate chocolate – but confused about the Sugar issue. This is a great question and one I’ve never really talked about on the blog. I personally do not eat chocolate chips(because of the sugar). I’ve made my own chocolate chunks, by melting unsweetened baking chocolate, adding a little honey to sweeten, then spreading a silpat lined tray and freezing until set. Then I chop into chunks, then store in a ziplock in the freezer for recipes I need them. I have also used raw cacao nibs in recipes. 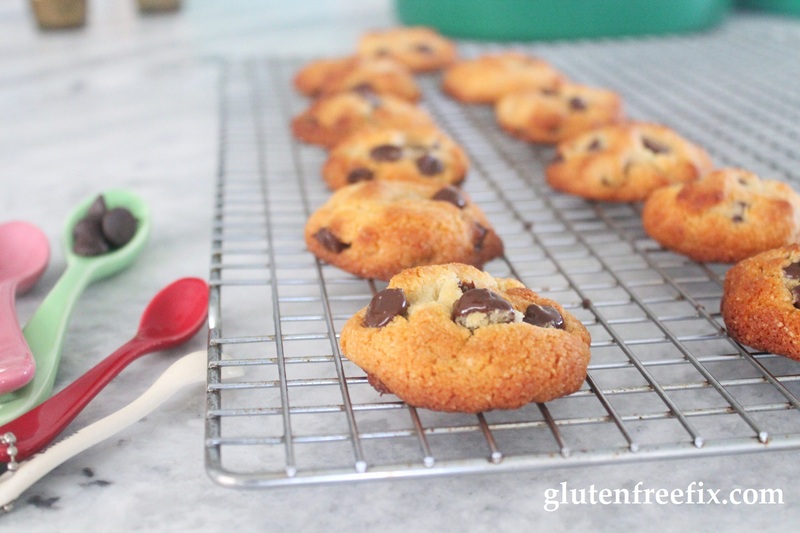 Many times when I bake for others, like my children, ,who are just gluten free (not SCD) I still use chocolate chips. I hope this helps, I would not want adding chocolate to your diet impeding on your recovery!